The Great Hall in Hogwarts Castle is the main gathering area in the school. Students eat their meals, receive daily owl post, and have certain special events here. The Great Hall is a large hall that can easily hold all of the schools students, staff, and guests. It has tall walls that reach up to the ceiling, which is covered with candles and enchanted to look like the sky above. At the front of the hall, is the staff table, which is designed to house the entire Hogwarts staff. The highlight of the table is the throne-like chair in the centre of the table where the current Headmaster or Headmistress sits. To the left of the table is a door which leads down a spiral staircase to the Trophy Room. The Welcoming Feast is a traditional part of the school year at Hogwarts School of Witchcraft and Wizardry, held in the Great Hall. Held on the first night following the arrival of the students on the Hogwarts Express, the Welcoming Feast is notable for including the Sorting of all new students into their houses. A Duelling Club was started by Professor Lockhart when the Chamber of Secrets was opened, during the 1992–1993 school year. He was given permission to teach students how to duel, in an attempt to help them learn to protect themselves. Lockhart was joined by Professor Snape, who worked as his assistant. The Halloween Feast at Hogwarts School of Witchcraft and Wizardry occurs on the 31st October every year. Usually the Halloween Feast is festooned with sweets-filled pumpkins, bats, orange streamers, water snakes and all sorts of Halloween-related decorations. There is usually some entertainment at the end, this may be by the Hogwarts Ghosts who pop out of the walls and do formation gliding. It's an highly anticipated feast which most Hogwarts students look forward to every year. The Yule Ball is a tradition of the Triwizard Tournament, though not regularly held at Hogwarts School of Witchcraft and Wizardry. It is a formal dance held on Christmas night of a tournament year, and is opened by the tournament champions and their partners. At Hogwarts, where the Yule Ball was held in 1994, only students of fourth year or above were permitted to attend, though younger students could also go if an older student invited them to accompany them. The ball begins at 8:00 p.m. and ends at midnight. The Christmas feast is held on Christmas Day. It is attended by the teachers and any students that have chosen to remain at Hogwarts over the Christmas Holidays. The feast is prepared by the House-elves in the kitchens, and consisted of a hundred fat, roast turkeys, mountains of roast and boiled potatoes, platters of fat chipolatas, tureens of buttered peas, silver boats of thick, rich gravy and cranberry sauce. For desert flaming Christmas puddings were served, with silver sickles hidden within the pudding. Apparition is an optional twelve-week class offered at Hogwarts School of Witchcraft and Wizardry for, as its name suggests, learning how to Apparate. The class begins shortly after the Christmas Holidays and is offered to students who are seventeen, or who will turn seventeen during the school year, and costs twelve Galleons. It was taught by Ministry of Magic employee Wilkie Twycross in 1997. An O.W.L. (Ordinary Wizarding Level) is a subject-specific test taken during Hogwarts students' Fifth year, administrated by the Wizarding Examinations Authority. The score made by a student on a particular O.W.L. determines whether or not he or she will be allowed to continue taking that subject in subsequent school years. During these examinations a giant clock face and a huge swinging pendulum are placed at the far end of the hall in order for students and examiners to keep an eye on the time. N.E.W.T.s (Nastily Exhausting Wizarding Tests) are subject-specific exams that seventh-year wizards and witches at Hogwarts take to help place them in a position at the Ministry of Magic. As not all wizards pass or even take the N.E.W.T.s, they can find other jobs using their O.W.L. results. 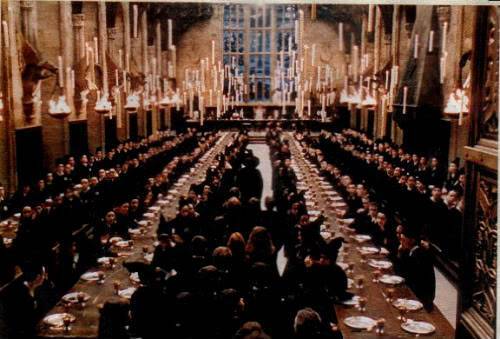 The End-of-Term Feast (or Leaving Feast) is a traditional part of the School Year at Hogwarts, held in the Great Hall. It occurs on the last night of the term; the Feast is notable for including the awarding of the House Cup to the house with the highest points.